While south over the winter, I decided to finish a hand-stitched project that I had started last fall. It's a sketch that Pablo Picasso did of his new young wife. After tracing the design on the old looking fabric, I hand stitched her using brown Valdani cotton floss. 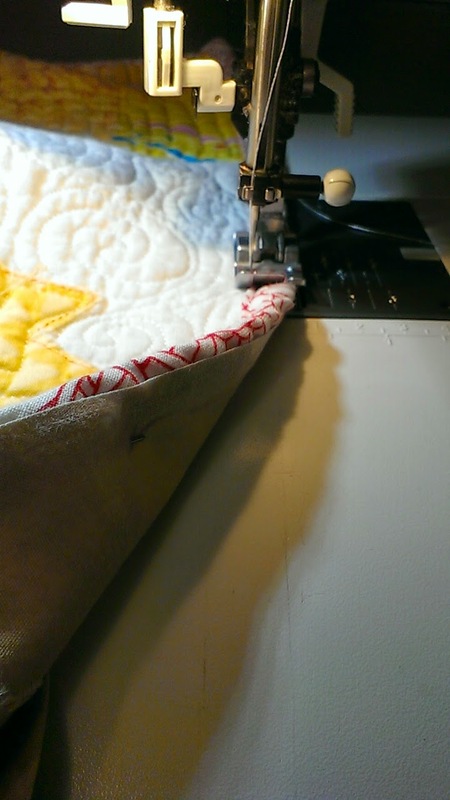 I always wonder, is it ok to mix hand quilting and machine quilting on projects? To finish this, I did free motion all around the hand stitching. I like it. It might not have gotten finished if I didn't machine quilt it. So for me, it's a good mix. 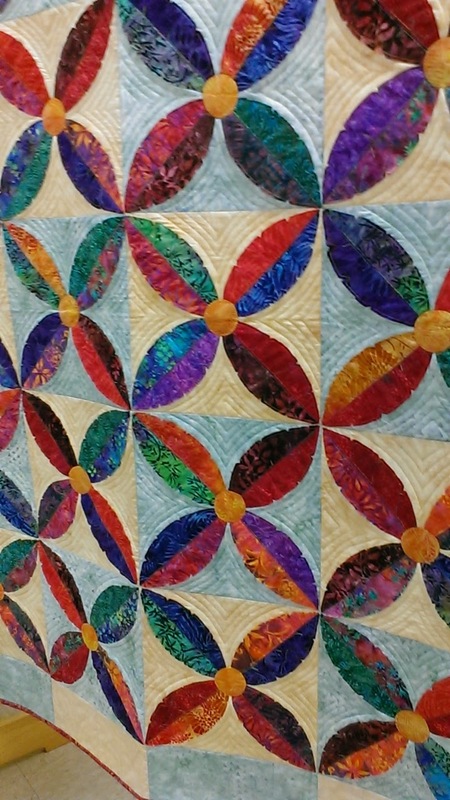 For the background, I used a pumpkin seed free motion quilting design. The thread was beautiful fine 100 wt thread and when you look at it from the front, you can hardly see the stitching let alone the thread. So I take this photo from the side so you can see the design. 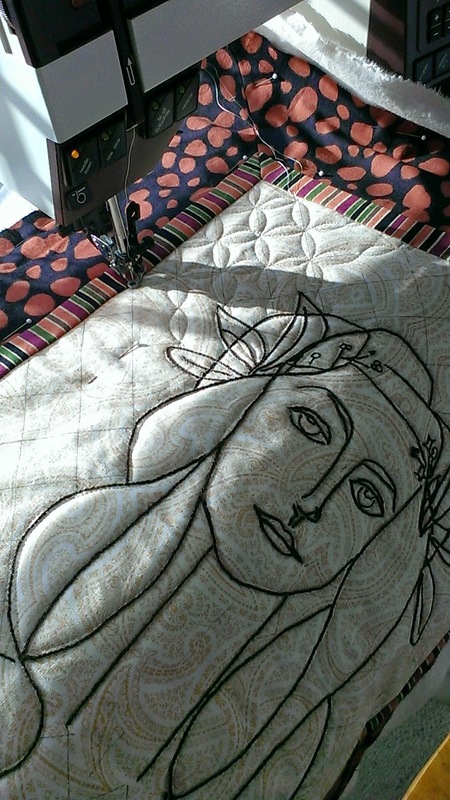 I loved seeing the pattern emerge as the light was streamed through the window over my sewing machine. I just love her. Her name was Francoise Gillot. We had another successful wallet day yesterday. 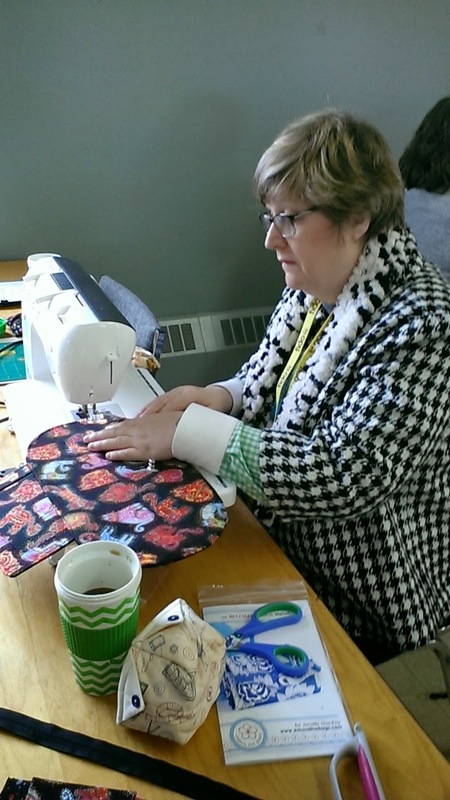 The Elm City Quilters are a very experienced group of quilters. They live handy to me, so I drop in on them when they have their work days once in a while. In addition to a nice little bit of socializing, they do everything that is current and many projects that are favorite classics. Marj giving assisting Christine, while Lucy watches too. Elm City invited me to teach a wallet class yesterday. 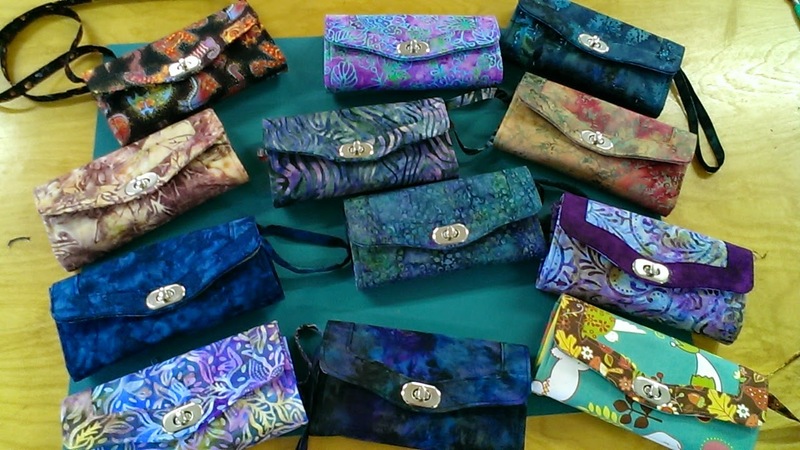 There was 14 in the class and I am so pleased to report that they all got their wallets done. A special thanks to Super Sewer, Marj who helped a few of the girls through some tight spots. And isn't that the beauty of doing this type of complicated class in a guild workshop setting. You will get help one way or another. 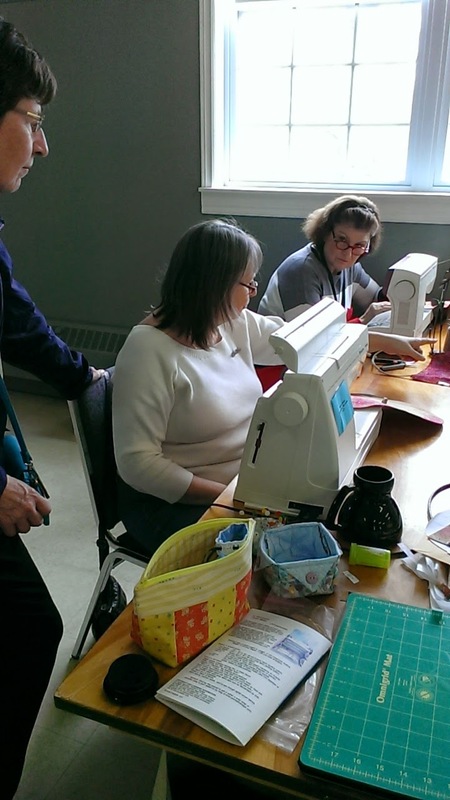 You might want to know, that with Marj's help, Christine was the first one finished in this Wallet class. Great work and a beautiful wallet Christine!!! Her wallet was made out of Laurel Burch cat fabric. Now that's concentration Sandra T.
Voila, 14 wallets. Done by the end of the day. My next local wallet class is July 17th. It is part of the EdVentures program here in the City. If you are interested, here is the link that you can forward to a friend. 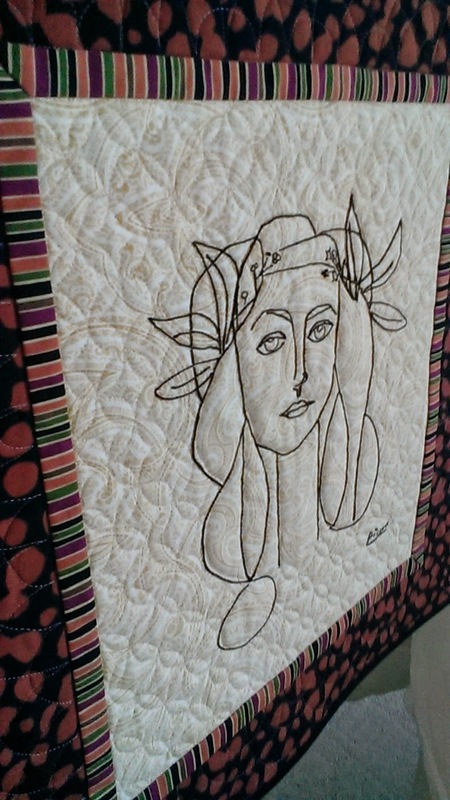 I did a shift at the Fredericton Quilt Show yesterday. Oh My. It was beautiful. I took a few pictures of some of my favorites. I know Linda H. took fabulous photos of everything so when she has them on the FQG Blog, I will provide a link here. But for now, here are a few of my favorites. the diagnol pattern. Step back,and wow. It's wonderful don't you think. 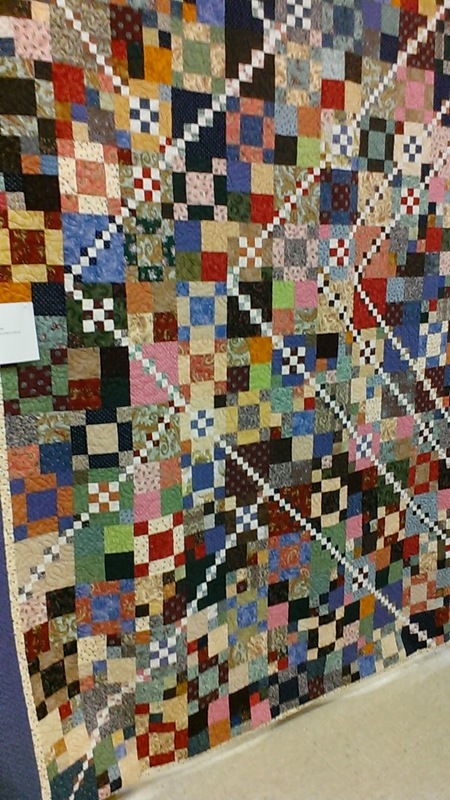 I loved this quilt of Diane Ramsey's. It's like a Pumpkin Seed on Steriods. Gwenda Mattinson made this entirely from scraps. It's just beautiful and big! Oh Sandy. I loved your challenge piece. Those skinny vines are to die for. I love how you used the challenge color of purple in a delicate way. 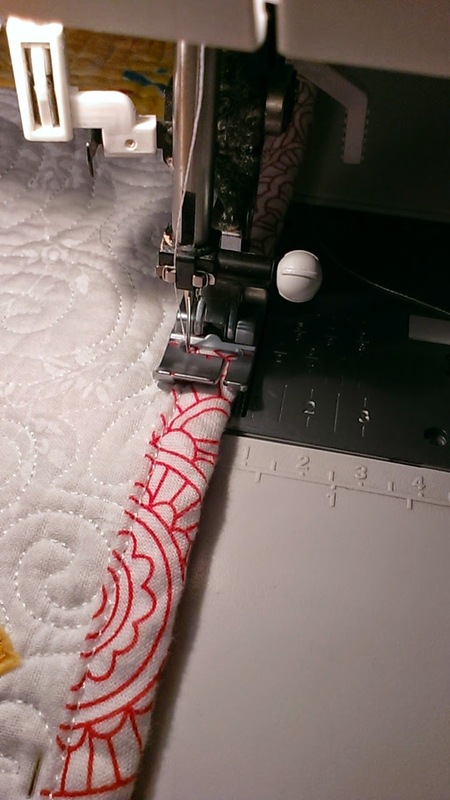 Usually I'm applying a binding with one of my favorite Pfaff feet, the bi-level binding foot. 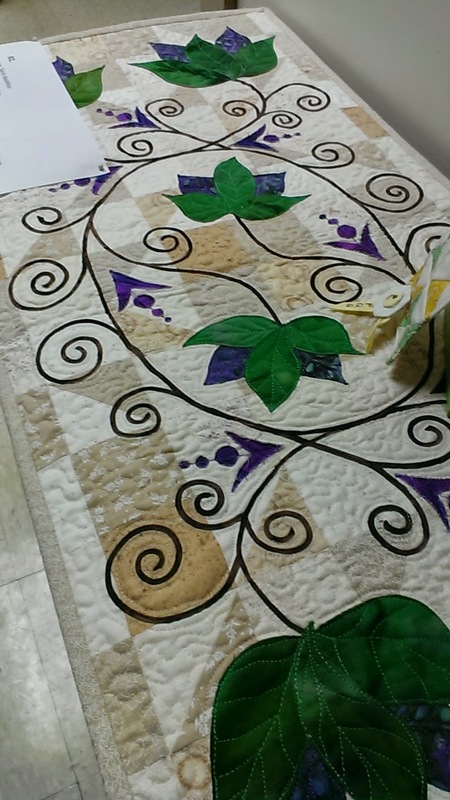 Today I was sewing on a temporary sleeve on a quilt for our guild's quilt show this weekend. This quilt is already bound. So when I move the needle over to the far 0 position, set my stitch length to a 6, which is huge, my machine bastes in the ditch. On the back is the temporary sleeve. I did hand stitch the bottom of the sleeve with a big stitch. Both lines of stitching will come out easily after the show. I hope to see you at the show. I will be there on Friday. If you are looking for details about the show, please visit our guild's blog page here. It will give you times, directions etc. 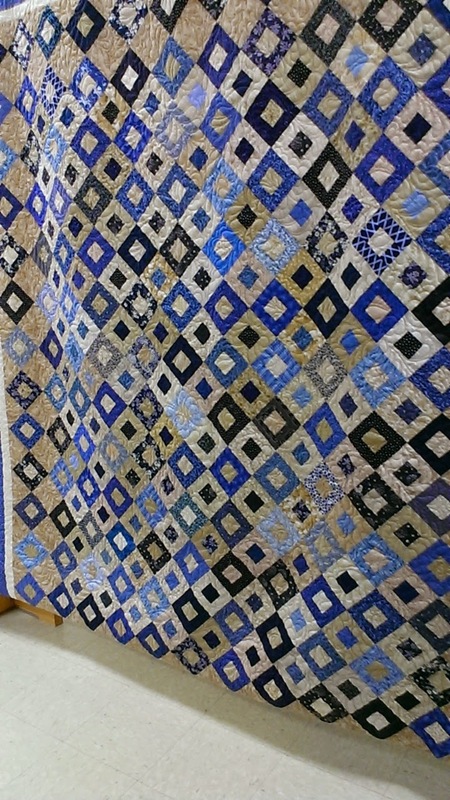 This quilt will be raffled off by the church committee starting later this summer. 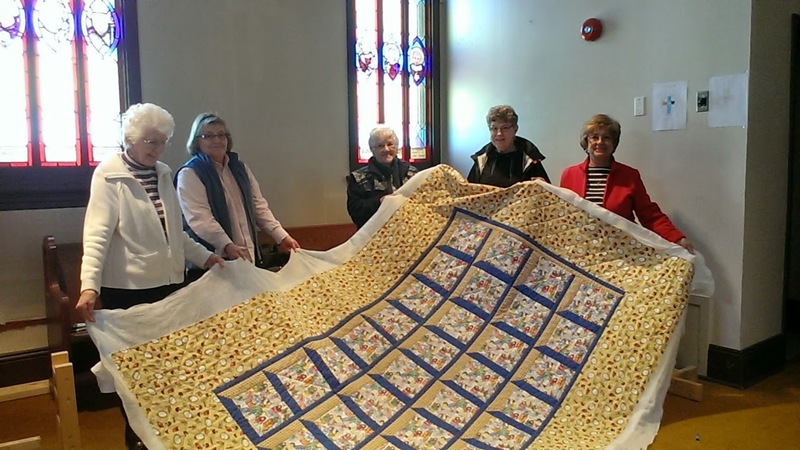 Many thanks to Willa and the St. A. Quilters.... We will put another quilt on next week. Stand-by to see that one.. It's nice. I'm excited to be back into the swing of things. Take a look. I've added a teaching link to the right hand side of my blog. Since I am away most of the Winter, Spring and early summer and November are my prime teaching season. 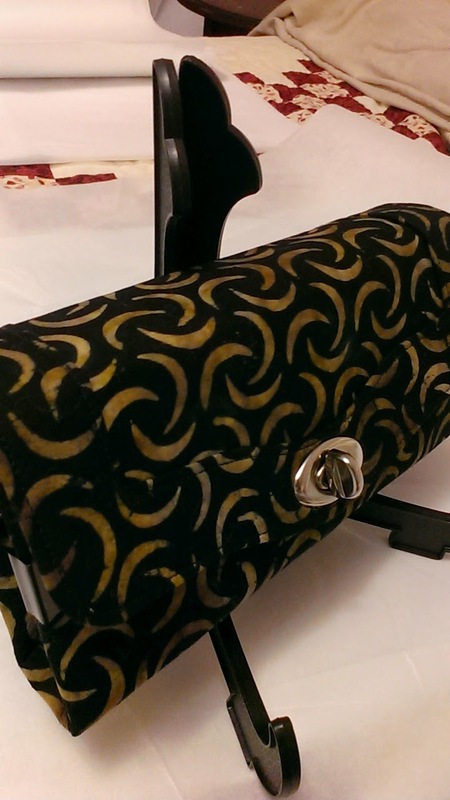 This week I'm preparing to teach a Smart Wallet class at the Elm City Quilt Guild, a local guild. I'll be seeing the students this Saturday to give them their kits and instructions for the class on the following Saturday. These are very experienced quilters. This class is a perfect way for these gals to stretch and learn a few new techniques. I'm kinda excited to get back into the swing of things after the winter away. I've made all new samples, and even found a few more simplifying techniques. 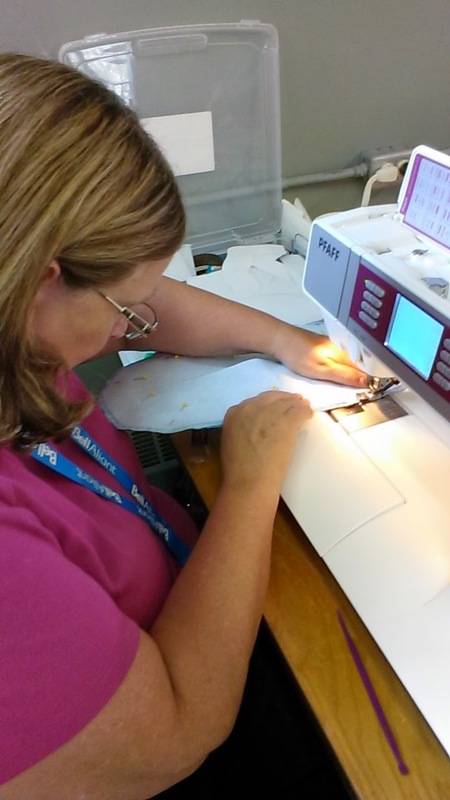 In the last year, I was working with some girls who own Pfaff sewing machines. The whole idea was to learn more about the machine and feet. We did this by making small projects - usually two or three hour projects. We were a small group meeting in each others kitchens. It was nice and intimate and projects get done quickly. But have had a number of people hear about it and ask if they can participate or start a new kitchen group. This got me thinking about having a Pfaff workday in a larger venue say once a month. I am hoping we can have up to 15 people participate. I have a venue selected but I have to check out the costs, outlets, lighting etc. I'm planning a "test" class for later May or early June. I have a the project all picked out that would be perfect for our first "new venue" class. 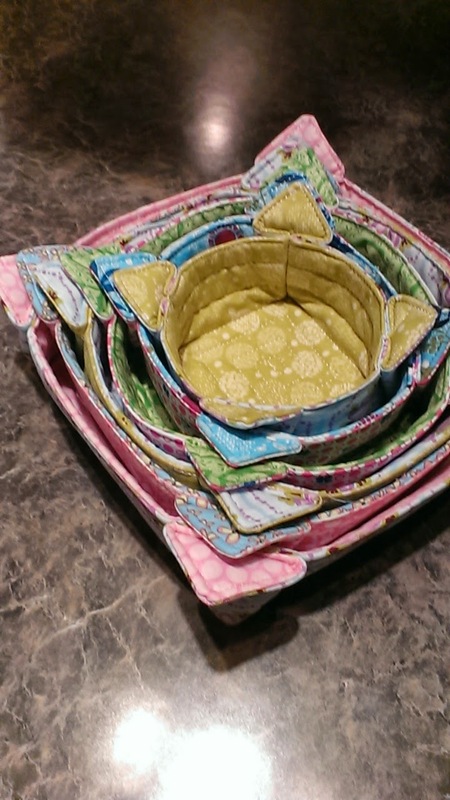 This nesting bowl project can be completed in a 4 hour class. This is my sample. 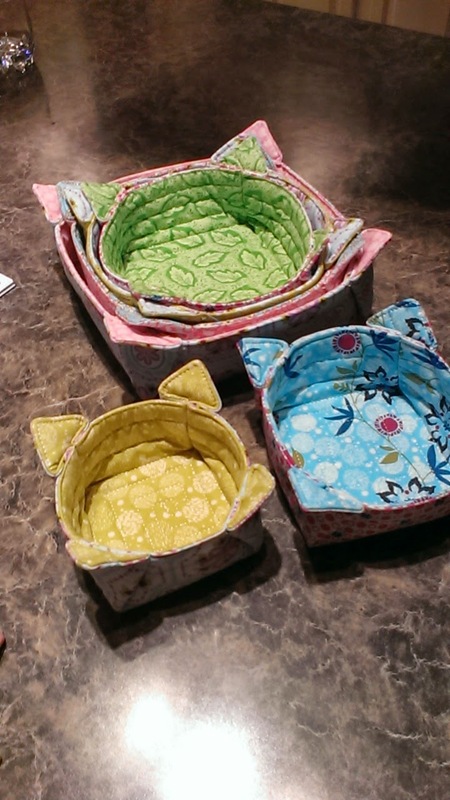 Participants will get a good bit of utilizing their IDT to machine quilt (not free motion) these nesting fabric bowls. Once they get through these bowls, they will have the confidence to machine quilt other larger projects such as placemats and table runners. Do you own a Pfaff? Are you local? Maybe you would like to learn some new skills. If so, let me know and I'll add you to my list. Well, we've been home for almost a week. After our 3+ day drive north, we've been busy with all kinds of errands. unpacking, laundry, cleaning, groceries, dentist, Insurance, Taxes, more groceries and volleyball games. We are finding it cold. We wear two sweaters in the house all the time. The air is dry. I get nose bleeds easy. But it's nice to be back where my kiddos are. I got some really good hugs this week. It's hard to do that over Facetime!! Miss Aurora is visiting us for the weekend. We are spending a bit of time in my sewing room. 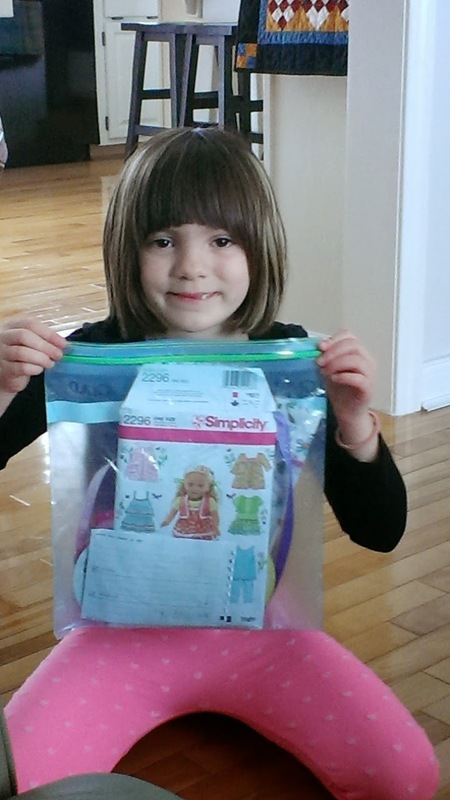 She has picked out 5 item of American Girl doll clothes outfits that she wants. 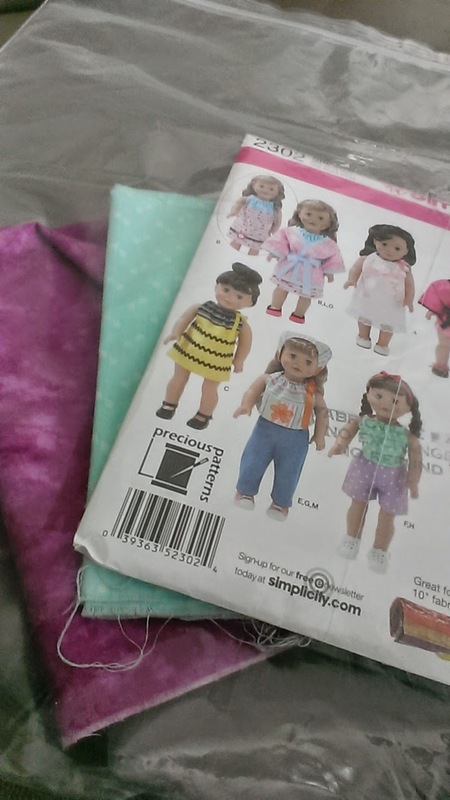 I have 5 Simplicity patterns. 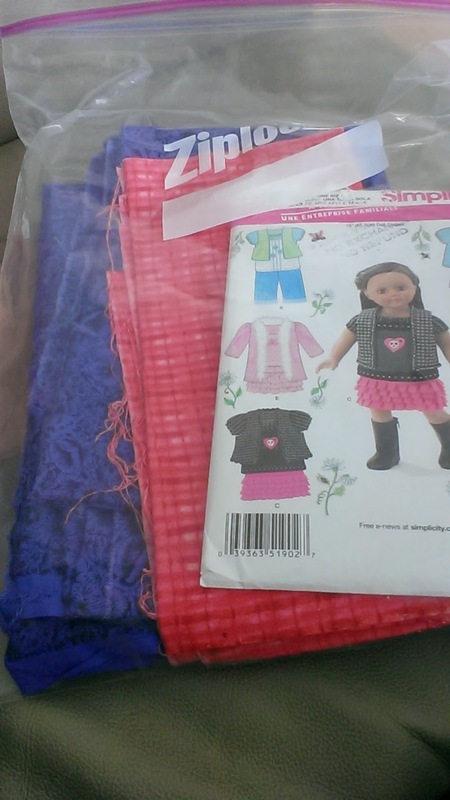 She matched up each pattern with the fabric that she wants me to make the outfit out of. It's all organized into ziploc a bag. She has 5 kits ready for me. In between my regular projects next week, I'll pull out a ziploc bag and make one. 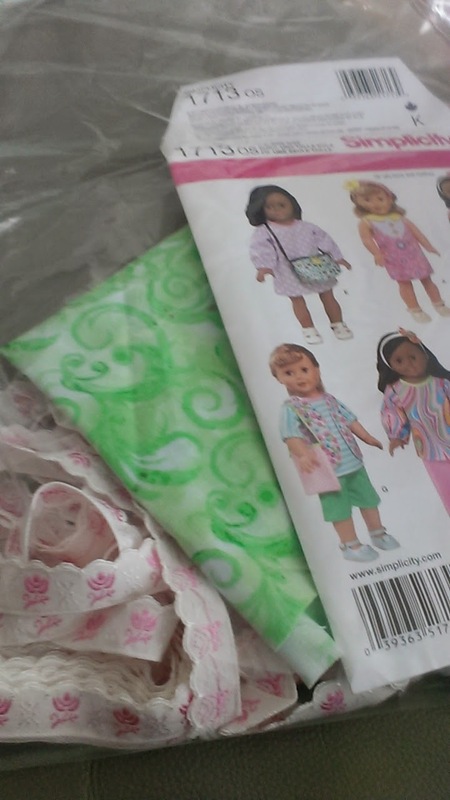 These doll cloths are a bit friggy to make, but I like making them because they are relatively quick. 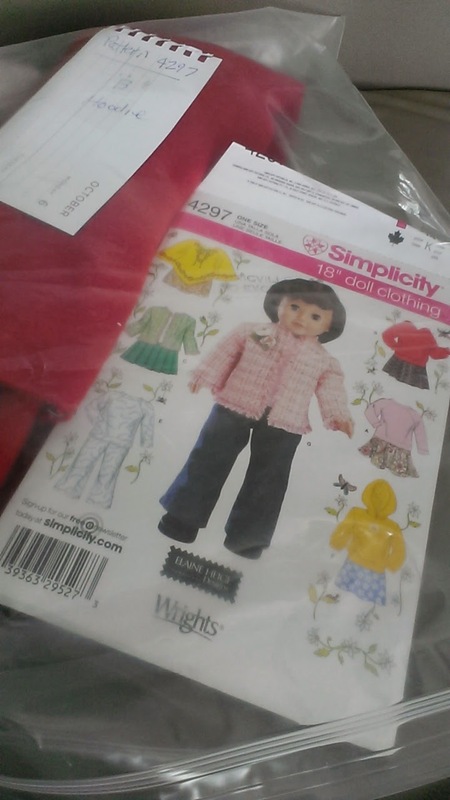 The next time Aurora comes for a visit, she'll have some new doll clothes. She wanted me to show you the kits.